Imagine perching atop a cornice of snow on a rocky cliff nested high in the Rockies. Your head reaches above the tops of spruce and pine. Even ravens do not fly this high. Your skis poke their tips out over the cliff’s edge. The wind blows strong and steady. Your heart pounds from the altitude, thin air, and knowledge of what is to come. You leap. Time slows. You hit the snow below hard, crouching to absorb the blow. A quick turn, then another, and you stop. Glancing back up the mountain, the cliff shows jutting rocks and branches not visible from above. And yet the cliff seems smaller now, not nearly as imposing as it felt before the plunge. While impressive, it is but one element on a massive mountain face that still requires your attention. You turn your back on it and continue down the mountain, adrenaline flowing, with more challenges to come. And so it will be with our Fiscal Cliff. When pundits and politicians speak of the Fiscal Cliff, they conjure images more akin to the cliffs of Dover, a one-time plunge from land to the rocky sea below. Or they invoke those animated towering cliffs from an old Road Runner cartoon where Congress plays Wile E. Coyote and shoots over the abyss, stares briefly at the voters, then plunges to his pain. Again. This cliff imagery evokes catastrophe and finality, when the Fiscal Cliff is neither of those. Leaping off the Fiscal Cliff need not be devastating to the long-term health of the country’s economy. Depending on your data source, the Fiscal Cliff is anticipated to have an impact of $500-800 billion on our current economy, which represents about 3-5% of our current Gross Domestic Product (GDP) or roughly the current cost of two years of our annual debt service. 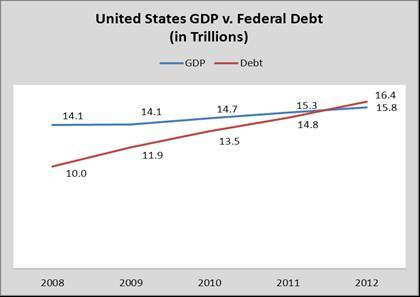 This Cliff has to be understood in the context of a $16 trillion GDP that has been growing at 2.9% per year since fiscal year 2008 and a $16 trillion debt load growing at 13.2% per year during the same period [see chart below]. Sources: US Department of Commerce, Bureau of Economic Analysis; Treasury Direct. This untenable state of affairs is not the responsibility of one party or politician. The debt fueled growth binge started under President Reagan—a leader widely viewed as a fiscal conservative—who oversaw a near tripling of the federal debt in his eight years in office. While a forced cut in spending and increase in taxes is inconvenient and initiates changes we may not like, we ultimately must face economic changes that we do not like. The catastrophe is not the Fiscal Cliff, but what happens if we as a country are not willing or able to cut our spending and increase our revenues as soon as possible. The very term “Fiscal Cliff” connotes disaster, that final plunge to our demise. But the Fiscal Cliff we face today does not represent the final step of a faltering economy, the demise of American greatness, or the end of opportunity. If anything, this Fiscal Cliff could be a much-needed first step toward reversing the United States’ 30+ year plunge into fiscal mismanagement, an over reliance on leverage rather than fundamentals to stimulate growth. We are at the beginning of a long journey, not the end. We firmly believe that the Fiscal Cliff is a precursor to a series of confrontations that American society will face over the coming decade with how we live our economic lives. Unlike previous confrontations that were militaristic in nature—the Civil War, WWII, the Cold War—this conflict is with our way of life, our sense of entitlement, and our obligation to future generations. Ultimately, we must determine the legacy we wish to leave. In the recent movie “Lincoln,” there is a point where the clerk of the House of Representatives takes a roll call vote on the Thirteenth Amendment, the one that ended slavery in the United States. As the clerk in the movie reads the names of congressmen who voted to end and voted to preserve slavery, we, nearly 150 years later hear those names and their respective votes. They are not anonymous players in history but people whose decisions impacted society for perpetuity. Many years from now—generations from now—Americans will look back on this time in history and want to know how we conducted ourselves. Did we turn in fear from difficult decisions? Did we fight to preserve our comfort at the price of those to come? Or did we step up to be worthy of our moment in history? We are perched atop a series of opportunities to make bold and difficult decisions, and we are blessed to live in a society where we can do so. Our hearts may pound from the knowledge of what is to come, as well they should.